Returning to Life - The new normal. We are at the beach. Our 4 year-old Luc and 30 month-old Abi are asleep in the same bed, in their room. GrandBe tucked them in and read them a story. They love it here. Of course, then they needed a glass of water. Bons is sleeping with a smile on her face. When she gets up in the middle of the night she looks in on her "kids", who will awaken her at 7AM by putting all four of their hands gently on her face and urging her to get up to play. The smell of the black cherry wood smoking 2 pork shoulders is in the ocean air. Lucas put on his special purple and black barbeque gloves and helped me arrange the charcoal and wood chunks in the smoker. He had to do it just so, to make sure we have a steady temperature of around 212 - 220 F for 12 - 14 hours it takes to turn "Boston Butts" into tender, succulent pulled pork shoulder. He did a great job. After he helped me, Luc ran to the top of the dune 3 times to report on the height of the waves and the fishing boats on the horizon. Abi came out on the screen porch and down to the beach when the hamburgers were ready to come off the grill. I picked her up and we looked to see how many stars were visible in the early evening sky. She loves to be up high in my arms and pointing to where the sun went down. The horizon to the west had turned dark in deep purples with the last traces of red. Abi went still for a minute looking at the horizon. Bonnie is mostly out of pain, able to see, read, walk, drive and cook. She still uses her wheelchair in the house some of the time to take weight off of her sore back. She plays cars, colors and reads to the grandkids when they are here. Bonnie fixes breakfast du jour: usually sausage and eggs or deep-dish dutch baby pancakes with jam. Of course Abi has to help, with her stool parked hard by Bonnie's side at the counter. Abi participates in every step, and asks"why" when there is some new ingredient or technique. Bonnie explains in a voice that hums and sings. Abi nods and the creation of breakfast and closeness moves along. When the kids are not here, and Bonnie is not at some doctor's office, or church function, she spends most hours each day writing in her office. She has finished editing the first draft of the "story" section of our book; "How to Be a Successful Patient: Living!! with Chronic and Fatal Illnesses." Bonnie's story of zig-zagging along the boundary of life during her prolonged stays at Stanford Hospital, Brigham and Womens Hospital, UNC-Chapel Hill Hospital, New Hanover Regional Medical Center Surgical Trauma Intensive Care Unit, and Duke Hospital and her months of rehabilitations at Youville Hospital, Durham Regional Hospital, and Coastal Rehabilitation Hospital, is currently about 360 pages. The second section of the book is on the domains of competence one needs to develop if one is to become a successful patient. Each of these chapters are well-researched and outlined in detail. I think it will take a week for each of the nine chapters. The final section, a workbook of checklists, forms, and links to useful organizations and websites has also been well-researched and is coming along nicely. We are deeply dyed with a passion to produce a book that is of lasting value to patients, families and friends facing chronic and critical illnesses. In the meantime, I have been going to doctors to catch up on the "deferred maintenance" on my 61 year-old body. I have a deep sense of fatigue most days and depression from time to time. I have had a nuclear heart exam and stress EKG; a complete blood panel including some sophisticated cholesterol testing, and PSA tests and soon a sleep apnea test. I told the EKG technician that my wife was worried that she would lose her full-time care giver, and that I had to tell her the results of my test when I went home. EKG techs are trained to be upbeat, and that ONLY a doctor can say what the squiggles on the roll of graph paper mean. So she said "You did very well! ... after all we did not put you in an ambulance and send you off to the hospital." This being the biggest heart testing facility in several counties, I speculate they send "customers" off in an ambulance more than once a week. Bonnie laughed when I told her my evidence for my heart being fine. We have lost track of the number of times I have taken her to a clinic for the usual tests or to a doctors appointment only to have the doctor INSIST that Bonnie be admitted to the hospital via the emergency room, which was normally an 8 hour process. Thank God, our new normal is rebuilding our health, while we play with our grandchildren, write our book and rebuild our beach house. This beach house was condemned after Hurricane Floyd in 1999. We bought the house in 2002 and have stripped it to the studs and completely rebuilt it, piece by piece. Only the pilings have not been replaced. Our "30 year shingle roof" is 8 years old. Now the roofing contractor guarantees that it will NOT LAST more than 2 years ... or 1 hurricane. The shingles are fine, only the nail heads holding the shingles down have rusted off. Along the ocean, buildings and materials are measured in dog years. Central A/C units suffer the most from being on the ocean. Our Central A/C ducts and Air Handlers in the attics were replaced 2 systems ago, and use the now-out-of-date coolant. The outside Compressors / Heat Pumps are Tranes and only 6 years old. And while "Nothing Stops a Trane", one of the outdoor compressors died of salt air corrosion that ate through an aluminum block where it hits a copper fitting. The other unit is going fast. When we replace these units, I am having the coils coated with a "marine kit". And I am installing 8 rainbird irrigation heads that will popup and rinse down the outdoor units everyday at 3 PM. This should increase efficiency and reduce the salt corrosion. We aim to get 10 years out of the new A/C units. In any case, the entire A/C system on both sides of the house has to be replaced this month, down to the last duct and vent. I have whiffed traces of mold coming from the air handler and/or ducts. I had swabs done on both sides which have confirmed my "diagonsis": Black Mold. Since Bonnie continues to be immune compromised, black mold can create an infection that would spell the end. In the meantime, I am trying to find the source of a "small water leak" over the ocean window in our bedroom, that only shows up after gale force ocean storms. Roof? Window flashing? Windows? I am going to have to try to find the source of the leak using a pressure washer. Living on the front row of the Atlantic Ocean is like hanging 5 on a surf board for life: It is exciting, very taxing and only for people with free attention and resources. I wonder how long we will be able to keep up with the ocean. I have another two pages of "To Do's" to get this house right for us and next summer's rental season. We have to replace or repair at least 4 pilings on which the house sits. They are becoming wasp-waisted where they hit the sand. Then we have to replace 2.5 feet of sand that a hurricane storm surge washed out from under the house. A beach house stays in place in direct ratio to the pilings "friction inches" with the sand. Replacing the 2.5 feet of sand will be a good thing, but requires permits from the City, State and Coastal Area Management Authority. Pilings and sand can only be replaced during months of the year when the noise will not disturb the nesting sea turtles. We have to disconnect the septic system and connect to the new Oak Island sewer system, which may come on line by January 1. This will allow us to park 2 cars UNDER the house, and give Bonnie a wooden walk way to the stair lift. She currently has to navigate in sand with her tiny toeless feet, which is a challenge. I may even get my high end stereo system set up this year. By the end of May 2010 we should have our book in condition to publish, AND have our once condemned beach house very much a home for us. Now, IF the 2010 hurricane season leaves the house in place, next winter I am going to see about creating some raised-box landscaping. Bonnie wants Birds of Paradise and I want Japanese Satsuki Azealas. We shall see if we can find species that can cope with the temperatures and salt air. My greatest joy is watching Bonnie play with her grandchildren. Bonnie lived for these days and these days are here today. It's uncommon that Hollywood produces a movie for us older women. Now that I am one, I feel a bit obliged to support it. Besides I have long been a Julia Childs fan from afar. And so I determined that I must pay the bucks go to see Julie and Julia at the theater. Daniel didn’t quite understand why I didn’t just wait for pay-per-view. Beanie was an enthusiastic collaborator in the venture. Ironically the weekend before we went we spent the evening, and eventually the night. with our friends Julia (born Julie Ireland, Ken’s sister) and Tom Childs. We had glorious food and heard stories of her own culinary adventures with her famous name. On Monday Beanie and I laughed through the movie in the company of fifty women who looked a lot like us. Go Hollywood. I’ve since found guys, like our nephew Adam, who also sing praises to the movie. Daniel will enjoy it pay-per-view. I had wanted to go to Summer Shack when we lived here and drove by it often, but with my restaurant and budget limitations, never did. One goal before leaving New England was to EAT A LOBSTER. We planned to take Adam and Bean for a celebrate New England with an early dinner on Sunday. The forces of history seemed to be converging: this was the time for Summer Shack. Then Beanie told me that she had gone with a friend to a restaurant on Rt. 9 that was fabulous and casual N.E. Well, maybe this wasn’t the time after all. Why drive all the way to the other side of Cambridge? When she came home Sunday morning, she gotten the name of the restaurant and handed it to me: Summer Shack! The forces of history indeed converging. The lobster was soaking in butter, chives and lobster roe. Provided with a lobster bib and a cracker, I went to town and completely destroyed the lobster as savagely as I possibly could. When I was done, I rolled my corn on the cob in the lobster butter...it was pure unadulterated joy. In addition to soaking my corn on the cob, I also used two dinner rolls to get more sauce. I wish now that I had asked for a spoon so I wouldn’t have to leave that last bit. I haven’t been successful in finding the recipe online for free. I know that it is in Jasper White’s cookbook on lobster, but we only get lobster once a year at the beach... a church fund raiser. We have lots of crabs, oysters, scallops, and shrimp though. I’m debating a $20 book on lobster. If any of you have this recipe, please send or post it. I have found that it uses chervil as well as chives. I’m thinking of a fall herb garden in planters. Suggestions welcome, please. UPDATE: Good and bad news at the eye doc today. I have 20/40 vision in my left eye, showing when I can stop wearing them 24 hours a day, the swelling will go down leaving me with pretty good vision. Bad news is that I can't go to 15 hours a day yet. The defect grew appreciably when I didn't wear them last night. We are taling it day at a time, going every day to the Foundation. Who was it that said there are only two sure things in this world? On Friday of last week, I turned my concentration from one to the other. This year’s ready to get ready to do tax returns was an extra long effort since I had done none of the year’s categorizing in Quicken. It was a good opportunity to be more systematic than I usually am and to figure out the categories that are most useful. With two rental properties, there was a lot to figure out as well as just the labor of putting in categories. I’ve now finished rental stuff that goes to Ron and Jennifer who co-own properties. Next week I’ll turn to the rest of our taxes and also analyzing where our money goes (like 17k in medical after our extensive medical insurance). oh well. I intend to write sometime about our country’s ‘medical insurance crisis as we see it. Tonight I finally read your wonderful comments on my Ash Wed posting. Thank you. I love having good friends who are priests. I think about what you are doing frequently, especially on Sunday. Thank you for you images of how you spent Ash Wed. Thanks for the frank interchange about life support. I have a DNR that says no heroic means. I wonder if the grand-scale prayer I get is a kind of heroic means. It doesn’t have the vegetable connotation of medical means. This may sound inconsistent, but we have subscribed to a medic alert system for which I wear a call bracelet. Why call someone if you have a DNR? One reason is that the company can provide my med record stuff like allergies and also provide a copy of the DNR wherever I am. Daniel worries when he leaves me alone for even a short while. I think my cell phone SHOULD be enough, but I’ve yet to figure out how to keep it with me all the time. Unfortunately the call bracelet is only for the house because it relies on dialing the phone to connection an emergency assist person. Seems to me that a cell phone app would do better, but there doesn’t seem to be such a service. At $18 a month, this service is not a big decision during my tine of very limited ability. Speaking of ability, I am doing better all the time. I still like my wheelchair too much. It is too tempting to roll around the house whenever I need to move, but using it, I don’t get so completely tired. My leg muscles get stronger all the time. I imagine a day, and soon, when I will simply forget to use the wheelchair. The doc will unstitch my left eye on Friday and I’ll start to wear my contacts again. I get a gamagobulin infusion again on Monday. Good for my immune system. Life at the beach is beautiful, though still cold for NC. Love and the peace of God to you. Here is my Independence Day firecracker. 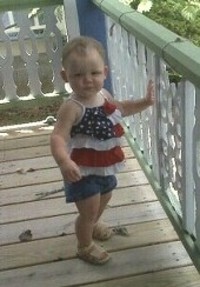 Abigail Jean is VERY independent these days and 100% fire cracker. If I’d been with her at the parade in Southport, NC, I’d probably have been registering voters for Obama. There were six such Obama events around Wilmington over the holiday. Pretty impressive. How was it in your neighborhood? Hope you had a good 4th of July holiday. Daniel and I had a quiet 4th. Margi and Peter came over Friday night. 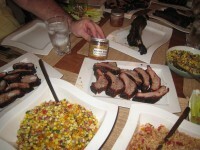 We had massive amounts of BBQ with Daniel coaching Peter on the art of Q. Daniel also made a fresh corn salad based on what he had eaten at Armadillo Willies in Los Altos. Margi and Peter have sold their MA house and today are moving half their things to Australia and half to a condo near their house. By comparison, our move looks easy and fool-proof. I’ve spent most of the day getting pictures and text for Daniel to advertise stuff we are selling on Craig’s List and also planning the itinerary for our Chicago-Texas BBQ tour. Daniel is doing a great job of looking up descriptions of things we are selling along with pictures and getting them on Craig’s list. I have a case of “analogic anxiety,” meaning that I’m worried about losing my teeth because I lost eyesight in one eye. I know it isn’t rational. Still, I keep thinking about how quickly my eyesight went. And now these ten cavities … what if the dentist can’t save my teeth. I’ve always had wonderful teeth, especially since I invested in gold crowns for all my molars. My Mom had pretty good teeth but she thought that false teeth would be better because Daddy never complained about his. She finally found dentist willing to pull teeth that were too good to pull and make her false teeth; it was a decision she regretted all the rest of her life. At the end of her life she developed cancers of the mouth from having dentures that never really fit regardless of how many times she had new ones made. My last visual members of Mom are with those horrible bumps in her face where the bulging cancers were filling her mouth. Well, that’s my anxiety story. Thanks for letting me get it out; it helps to confront these anxieties whether rational or not. These anxieties seem to have me a bit high strung recently. Night before last I didn’t sleep at all. I am overcome with zeal to plan our three week Midwest (aka Barbecue Tour). Some of you have gotten my messages about when we expect to see you. I’ve been calculating routes with Google maps, figuring out how long we can drive, what will make a good visit with people along the way, and really absurdly looking a reviews of BBQ places to decide where we should eat. This last task is absurd for ME to do because BBQ is DANIEL’S thing and I know that he will want to do that research and make those decisions. So, why am I so obsessed with itinerary planning? Partly it is a creative outlet. I forgot some bread I had in the over the other night; Daniel took the charred remains of a loaf to the garbage center. That event discouraged me from doing much cooking for creativity. Also I think I’m planning our trip out of here to get myself involved with ACTUALLY MOVING OUT. I can project being gone in a very concrete way to soothe myself about leaving a place we have come to love. One person we REALLY love in Cambridge is our grandson Jack. 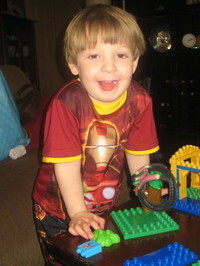 He is 3 ½ and learning all the time. He has become quite the builder these days. We will miss that boy. I'm being happy about our decision to drive up here for a week or so every quarter (a plan the eye doc insisted on). I’ve also been spending some time in the little park at Harvard Square. When we first moved here I imagined that I would be spending time there, but of course I haven’t until now. Now I go to Staples to buy moving boxes then sit and drink ice tea and watch people in the park while I wait for Daniel to pick up me and my packages. In this picture you can see that I’m pretty happy despite this anxiety stuff… and also that I have naturally VERY curly hair. Since I haven’t had any chemo in well over a year I have no idea how I got this or how long it will last, but it is cute, don’t you think? Ouch, it has been a LONG time since my last post. Thank you Betsy and Melanie for prompting me. Bets, I’ve been thinking of all the good Tex-Mex food you are eating (though Melanie may get better food in Houston!). Speaking of food, we have been cooking around here. What started as a relatively small BBQ for students in the online course I took this spring (they are on campus for a two week course) became an outdoor dinner party for 30. Daniel has learned to cook “mama style” and so of course we had food for 60. It was so much fun to host a party again. I baked bread and made half a dozen sides. It felt good to sit down with our guests and just get to know them. I had to go to bed for a couple of days afterward. 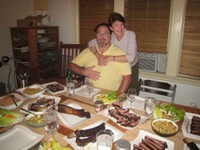 Last Friday Margi Olson and her husband came for dinner. On a whim I invited Emmett McTeague. Emmett hired Margi at Aetna during a sabbatical she had twenty years ago. She lived in my Hartford house during the three days she was there from NY. Emmett and Barbara live in Rhode Island now, but they came with less than 24 hours notice. Before we moved here, Margi, Emmett, and I had some rounds of email about getting together; after four years we finally made it happen. We had such a good time catching up on the past two decades. Margi and I shared the house just before she met her husband Peter; Daniel and I met during her last month in Hartford. When I got overly tired after a small dinner party, I began to pay more attention to the small rash I was developing. Sure enough my graft vs. host problem is back. I’m back on 20 mg of prednisone (ugh). It is giving me more energy even if artificially so. I’m donating my seminary books to St. Philips, the church I’ll be attending once we get moved. I thought I had about a hundred books. Turns out the donation will be almost 300 books. St. Philips has no library currently. So, I figured I should start a circulation system. I designed a book plate with our names as well as identifying St. Philips as the owner of the book. The book plate invites people to email me if they want to talk about the book. When I thought of donating the books I was imagining just putting on a book plate and shipping them off. Starting a circulation system that is all paper based is quite another project. I found a library supplier for labels and those little envelopes that hold circulation cards. I’ve been looking up the Library of Congress number online, entering book information in what will pass for a database, and then copying some of the information onto a card label template. After computer work during the day I do the label sticking (onto cards; card holder, book plate, and the spine label onto the book) at night while watching the Celtics beat LA. All the time I’m thinking about my books on contemplation and trying to maintain a contemplative mood in this action. It’s been a good exercise; I’m almost done. There’s a certain reflection on life in doing a task like this. We lost all of our books in the moving fire four years ago. While cataloging some of my spirituality books I would remember a book that I’d lost. This collection is not quite complete without that book I’d lost and not replaced. I’m also fascinated by looking at what became a passion for me even when I didn’t have a course on the topic, C.S. Lewis, for example. This has been a good practice for me as a completion of seminary study. It’s given me a perspective on my path here that I don’t think I could have gotten another way. I’m reminded of how much we get when we give. I would never have cataloged all my books with such loving care and so would have missed this time of retrospection and inspection as well as what we call “formation” here in the seminary. I’m reminded of Melanie’s observation that in 33 years she hasn’t written a hymn like she did when her music teacher told her to listen to the sun; why don’t we find the time to do things that are so satisfying? Next week I’m in NC being Zac’s chauffeur to his baseball day camp. His mother reports this about him: “Right now he is yelling at Abi "give me a break Abi" as she knocks down the tower he is building. Now he is mumbling "thank you very much Abi... I didn't even want another person in my family..." I’m very much looking forward to being there. Good Friday and the Saturday following is a time we pause and contemplate death and suffering. I wrote on Thursday about the loss of Bill Buckley. Two wonderful women in my life died recently. I am grieving the deaths of my friends Rosemary and Diane. Rosemary lived a long life, one that all who knew her admired. She had the same kinds of travails that life entails, but as long as I knew her (about ten years), she guided her life like an angel. She was very active at All Saints’ until she moved to Palm Desert to be near her daughter a few years ago. I regret now not calling her often. Those are the regrets we face when it is too late to do anything about them. She retired from a teaching career and opened a nursery where she specialized in flower for special occasions. She was a flower in all senses of the word. I was only beginning to learn about spiritual direction when Rosemary and I lived near each other and saw each other often. I knew that what I was getting from Rosemary was spiritual direction in so graceful and beautiful ways. My life is diminished by her moving on. My friend Diane did not have the opportunity to live her whole life. She developed a fast growing cancer in her early 50’s. I knew Diane through a group in Silicon Valley we called “the culture club.” We were a bunch of internal and contract consultants that worked with organizations to revive their cultures, especially using information technology. I was mostly an internal consultant; I had a salary. Diane was a successful contract consultant. I always admired her ability to make her own way and to provide value to clients that kept them coming back for more. I don’t know much about Diane’s last days. I hope that she came to peace with her premature call to heaven. I suspect that she did because she was always peaceful and confident in her life. Her grace was an inspiration to all who knew her. Like Rosemary, she found peace and beauty in maintaining an amazing garden. Her memorial service is being held at her favorite garden shop. Wow. As we approach Good Friday, as Christians or not, we encounter questions about the death of Jesus. I am not of that school of Christianity that holds that Christ had to die to redeem us from original sin. The gospels are pretty clear that Jesus was a prophet of the first century, calling people to admit and repent from their sins. He refused the claim that dietary laws and other rituals had anything to do with repentance. He spoke for the poor. He taught us that the first will be last, and the last first. And for these radical ideas, he was killed by those who thought his revolutionary theology would bring destruction to Jews living under Roman rule. To the last, he called those of his generation to stand up against oppression. And to this day, this is the meaning of Jesus crucifixion. C.S. Lewis observes in a fine little book called Mere Christianity that one meaning of Christ’s death is an example for all of us about how to die. God, being God, had no experience of death. By taking human form, he could die as a human and in so doing show us how to die. The path of Jesus to death is integrity and courage. March 20th is Maundy Thursday, the day on the Christian calendar where we recognize the founding of the Eucharist/Lords’s Supper. Many churches also have a ceremonial foot-washing by the clergy to celebrate the servant function of church officials. I think of it as the last day of Lent, but I’m not sure that is canonically correct. The day became a favorite of mine the same year as Ash Wednesday, the day that begins Lent. I’m not very fond of Lent, but these two days which call our attention to the facticity of death are days of comfort in my life. While at All Saints’ in Palo Alto, I would pray for hour in the chapel as part of the Maundy Thursday vigil, usually from 3-4 am. It was a precious time talking with God. I experienced miracles from my praying. I continue to take the time to “stay awake for one hour” with Christ on this night. This end of Holy Week is the most solemn time of the Christian year. Good Friday is tomorrow. This year, I am saddened by the deaths of friends. Daniel’s friend, William F. Buckley died recently. His passing touched Daniel more than I had anticipated. He immediately wrote a memorial which was published on the National Review website. It is a touching remembrance told from a perspective that few people had. Most know Buckley as an ultraconservative, combative guy and suspect that he had to be rude in his personal behavior. Nothing could be further from the truth. Daniel speaks of his humanity and his zest for new technologies. You can find that remembrance on Daniel's discrete weblog - www.danielshurman.com. It is the last of five posts and is called “Bill Buckley’s Uncommon, Common Kindness”. I recommend reading all five posts on that blog. Curiously, Daniel started this blog on Oct 14, 2005, just one day before I got news that my blood levels were extremely low, indicated a relapse of leukemia. I was quite confident that I would never have leukemia again and thought my tiredness was some kind of residual heart condition. How could Daniel have known when he did that writing on Oct 14th that we were on the brink of a whole new adventure starting on the 15th? Over the next few days he wrote elegantly of our position and my condition. In the middle of November, Jewish-raised Daniel had a remarkable dream of Jesus that guides his life to this day. He wrote about that in his blog too. It is some of his best and most intimate writing. Good reading in this Holy Week. After Daniel's Dream of White Light / Christ posting in November of 2005, our attention turned in a more focused way onto me. The first posting of this blog was December 7. Daniel started writing here in part because I was often unable, but mostly because this writing is a source of comfort for him as well as for me. Jennifer sent me this joyous picture of the kiddos. My phone is at Sprint getting its screen replaced. I dropped it on Saturday and shattered the screen in a fluke accident. Funny that my phone problems continue to correlate with my health problems. ugh. This is a comment about Daniel's last post. I give thanks often for my college major in communication for teaching me that we live in the worldw of our own mental models, not an objective reality. My personal history is what I remember (public history is what got recorded by someone with certain intentions and in a particular context). All of this is to say that Daniel’s description of my resistance to his and the doctor’s wisdom is completely different in my recollection. I’ve learned that protesting another’s recollection isn’t very useful, but I did want to document that I disagree with what he has said about me, just because I strive to document what is true for me here on the blog. Thank you for your patience as we reveal the stresses in our relationship that are coming with our continued challenges. It is comforting for me, and I think for Daniel, to have friends who care about what is happening with us, both good and bad. While I don’t think I was ignoring wisdom of others, I have learned from my (recalled) experience with graft vs. host disease in my eyes is that I must be more diligent in attending to symptoms and must listen very carefully to what doctors and Daniel are telling me. I expected eye problems to go away when I got off Prednisone. If I’d been reading the literature better, I would have seen that my problems result from GVHD, not Prednisone. I’ve been on the web this morning (with my magnifying glass) checking out what is known about mouth sores and sinus. Betsy Hall has written here about how pernicious GVHD is. I’ve been so fortunate to have milder symptoms. The downside of feeling “healthier” is when I fall onto one of the mines that GVHD is, both Daniel and I are startled. With all my regrets about what I might have done that I didn’t, I’m also very grateful that my situation is as good as it is. Daniel has written about what I call the “big contact lens”; we are so fortunate to be in Boston, the one place in the world where a person can drive 10 miles and get help for the GVHD problem of dry eyes. If we were anywhere else, we would not have heard of this miraculous new technology. I used to have the mental image of being on a tightrope, liable to fall off unexpectedly at any moment. I had such a great Advent season, able to walk to chapel every morning, energetic to cook, I fell into the belief that everything was turning up roses. Although I was on Prednisone, I felt good and felt like I was continuously improving. I think I need to go back now to more of that “tightrope” way of understanding and living daily life. This means being more alert and sensitive to what could be going wrong. I am feeling pretty good, though quite tired today. Daniel says my body may just now be ridding itself of the anesthetic I got on Saturday. It does feel like that. We had three inches of snow by the time I got up, and I decided (wisely I think) not to walk to chapel to see if anyone was there (as I would have done in December). It is really snowy here and the kind of day that would make anyone just stay inside. I’m surfing the web about GVHD and now writing this blog. I’m lubricating my eyes at least every hour and keeping them closed most of the time. Daniel gave me a radio a couple of years ago. At the time, I had no idea why I would want that radio and was unimpressed with the gift. In the past two years, it has become one of my great friends. I don’t know what I’d do without it in the hospital. Since Daniel doesn’t appreciate NPR like I do, I’ve been listening to the radio all day with a headset. We were able to listen to the Patriots game on Saturday (we left our TV in NC when we flew home). Speaking of NC, Daniel plans to fly back to get the car (and TV) and meet with some contractors about a new air conditioner and paint for one of our houses there. Sunday is my 64th birthday; the best birthday I can imagine to see Zac’s basketball game on Saturday. I’ll ask the doctors about my going with Daniel on the flight down and driving home with him. The weather outlook is ok for the weekend, and I don’t think I’ll need to see a doctor in the four or five days of that trip. Seems like what I’m doing is mostly keeping my eyes closed with lots of saline solution so that the outermost layer of my cornea will rebuild on both eyes. Well, this has been another chatty post from me. I can see text with my right eye by zooming the view to 200%. It feels good to be in communication with you, doing something that is almost normal. Thank you for your prayers and attention. Happy 2008 We are having a quiet New Year here at the beach. Daniel has gotten into the spirit of Anglican Christmas with its twelve days of celebration. He has presented me so far with fifteen cookbooks, two from Il Fornaio, two from Food Network science guru Alton Brown, and eleven “Beautiful Cookbooks” from regions of the world like France, Tuscany, California, The Pacific Northwest, The American South, Mediterranean, Asia, Australia, China etc. These are part tour books, part history of cuisine in the focal area, and recipes with lovely pictures of what the completed dish looks like. I’m particularly enjoying the history, for example how ancient Romans ate. I had no idea the Italians invented the fork nor did I know what a recent invention it is. I have a pad of small post it notes for marking recipes I want to make. Daniel is promising to take me to any region where I master three recipes. We are having fun with all this. It is a delight each morning to get an eggnog latte and another beautiful book for a present. Today is the eighth day of Christmas and I’m not nearly ready for it to end. The large format cookbooks have fourteen point type. My vision is quite limited right now and that makes it barely possible for me to read the books. I had hoped to put off seeing an ophthalmologist until I return to Cambridge at the beginning of February. Now I plan to call in Wilmington tomorrow until I find one where I can get an emergency appointment this week. I think I may have infected my eyes. Oh pain. Working in Microsoft Word with zoom text set at 200%, I’m able to write this and also to get the final papers for my courses finished. Normally I can get only a couple of hours of writing before my eyes give out, though today I was able to do twice that. It is great to be so nearly finished when I’m facing a Jan 7th deadline.